AM02 Tower. 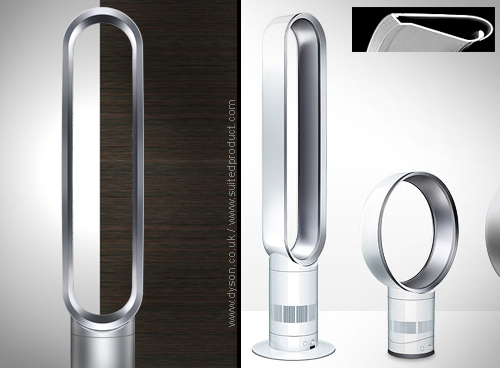 Dyson Air Multiplier™ fan. The new Dyson AM02 bladeless Tower fan is powered by an efficient brushless motor to draw 33 litres of air each second through a mixed flow impeller (technologies used in turbochargers and jet engines). Airflow is amplified up to 16 times using Air Multiplier™ technology (the 93% of the air generated results from the inducement and entrainment process of surrounding air). With no fast-spinning blades, it's safe, easy to clean, and generates smooth air with no buffeting. Dimensions: 100 x 110 x 190mm.